I am a big fan of Crockpot oatmeal with old fashioned oats AND steel cut oats. I like to grab whatever I have available when the weather is cold. Oatmeal is a great solution to my healthy breakfast dilemma. It is whole grain, no sugar added, four grams of fiber per serving, and five grams of protein. There is instant oatmeal, of course, but it doesn't taste as good as old fashioned rolled oats, or steel cut oats. Also, many of the packets of instant oatmeal have added sugar and flavors that may or may not be delicious. And, it costs A LOT more per serving than a regular box of rolled oats. 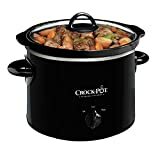 Buy a 2 quart Crockpot (see below – only $10-$12) or slow cooker and mix your old fashioned oats and water at night. In the morning, your oats are ready to go! It is SO ridiculously easy and (for you college students out there), you don't even NEED a stove. You can buy Quaker Old Fashioned oats or find the rolled oats or steel cut oats from the bulk section of your supermarket (if it has one). I find that the bulk section oats are less expensive and fresher than Quaker. Use a small slow cooker (1.5 – 2.5 quart). I used my large one and it really made a mess to clean up. Picture crusty oatmeal glued to my cooker. The small ones are perfect for this task. Change what you mix in to your oatmeal. You can get bored with oatmeal if you eat the same thing every day. Add different things and look forward to the meal. Don’t forget the savory option! peanut butter, almond butter, etc. How do you fit oatmeal into your life? 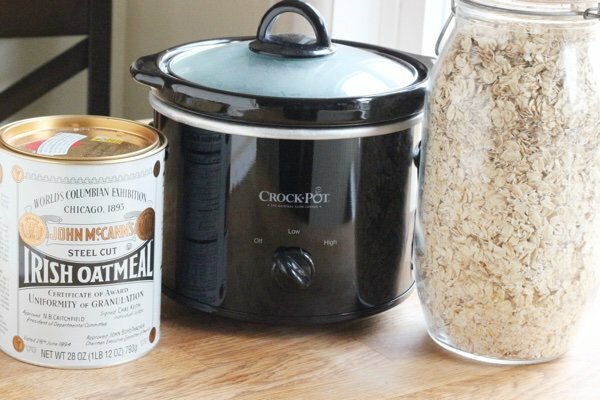 Mix oats and water in slow cooker and cook at low for 8-9 hours. Amounts can be doubled or halved depending on the size of your cooker. These recipes will work in a 1 1/2 - 2 1/2 quart capacity slow cooker. Make Your Own Instant Oatmeal And Other Great Ideas From "The Homemade Pantry"
@Julie - yes, add your mix ins after the oatmeal is finished cooking. Keep trying different stuff until you find your favorite blend. Thanks for your question! what is the measurement for a serving? I have old fashioned oatmeal every morning as I find it fills me up to lunch time & I don't feel as hungry. I have started adding 1 TBS chia seeds to the oatmeal. I make enough for one day at a time, & do it the night before in saucepan. I use about 1/8th cup oats and the chia seeds in boiling water. In morning I add a little more water, turn on stove and cook. I put a mixture of diced strawberries & blueberries & or walnuts. The old fashioneds are also great to make granola with. The carton of quaker old fashioned oats says a serving is 1/2 cup dry oats. I use about 1/4 cup dry as when you leave them soaking overnight they swell up. The calorie count is 150 per serving. I usually make mine in the microwave with milk instead of water; will milk work in the slow cooker too? I like the texture of both mixed. Can you mix the regular oats and the steel cut together? If so, what quantities. I usually make enough steel cut oats on Sunday for the rest of the week. I add molasses and cinnamon. I will have to look for small crockpot as mine is huge . I have tried overnight steel cut oats on the stove. Will definitely try this as I eat oatmeal at least 5 days a week. @Kristine - it is 1/2 cup uncooked oats or 1 cup cooked. Thanks for your question! 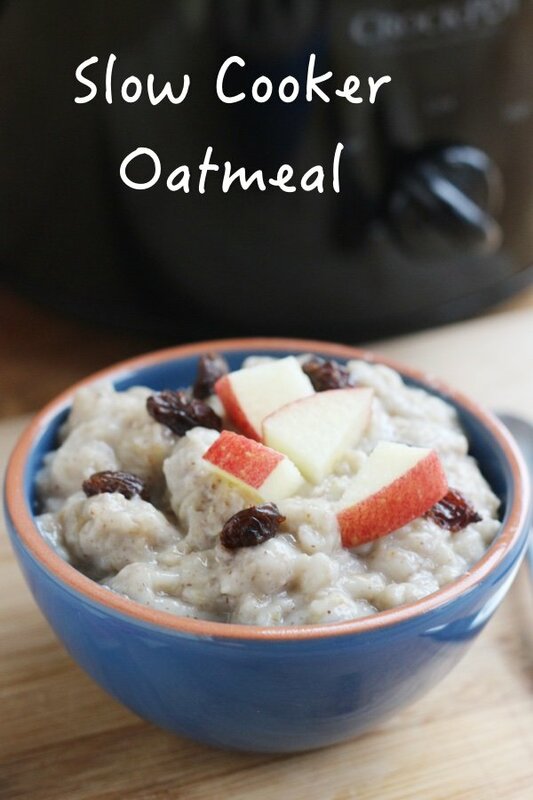 Another easy way to cook oatmeal in the morning is in a rice cooker. Just follow instructions but place ingredients in rice cooker. I watch my 3 and 4 year old grandchildren several days a week. When given a choice for breakfast they nearly always choose oatmeal. I use McCann's quick steel cut oats (last winter Costco had the large can for less than the price of the small can at my grocery store). I heat the water in the microwave, and cook it on the stove with raisins and cinnamon. It only takes 7 minutes. Sometimes we add chopped apple or craisons and serve it with a little brown sugar and milk. It only takes 7 minutes and they usually have second helping. Your photo shows my fave add-ins: raisins and apple. Dash of cinnamon. I don't see salt in your recipe, but I always add a dash of salt, too. If you want real decadence (I know - not our focus, but still...) toast the steel cut oats in a wee dab of butter until you can smell them - not brown, but perhaps golden and use half milk for the water. I also add a bit of TVP to up the protein. You don’t say what temperature, high or low for overnight oats? The recipe says on low; it's oatmeal for several hours. You'll love it! 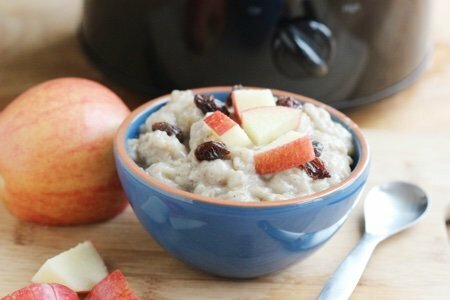 If I use only a half cup of oats would o use a cup and a half of water if cooking in slow cooker?